PRESIDENT Lungu has thanked the Israeli government for the courtesies accorded to former President Michael Sata when he visited that country a few months before his death. 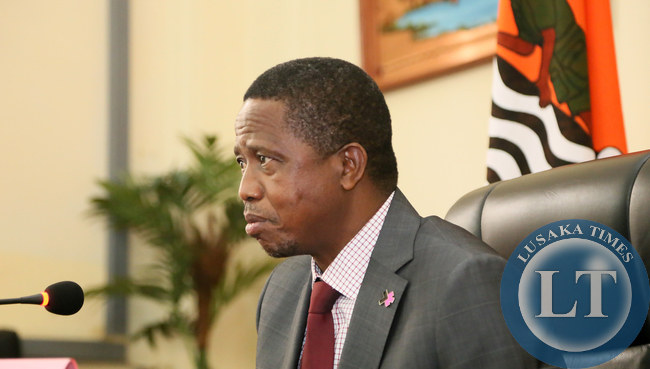 In a special message delivered to Israeli Prime Minister Benjamin Netanyahu by Minister of Foreign Affairs Harry Kalaba here on Monday, President Lungu said Zambia and Israel have enjoyed warm bilateral ties for over 60 years hence the need to strengthen the ties. President Lungu said the opening of the Zambian Embassy in Tel Aviv is a clear indication of the warm relations between Zambian and Israel. And Mr Netanyahu has hailed President Lungu’s Government for opening a diplomatic mission in Israel. Mr Netanyahu said Israel is one of the countries with advanced technology in various sectors, adding that his country is ready to assist Zambia. He said Israel is ready to assist Zambia in dealing with the electricity power deficit challenge, which has affected the entire southern African region. The Israeli Premier, who is also minister of Foreign Affairs, also discussed the possibility of providing university scholarships to Zambian students to study in Israel. Meanwhile, minister of Foreign Affairs Harry Kalaba says relations between Zambia and Israel will further strengthen following the opening of a mission in that country. Speaking when he officially opened the Zambian Embassy in Tel Aviv, Israel, on Monday night, Mr Kalaba said Zambia and Israel need to collaborate more by exploring new areas of cooperation. And Zambia’s Ambassador to Israel Martin Mwanambale said the opening of the Embassy in Israel is significant because it will enable Zambia and Israel to strengthen the existing ties. Earlier, Israeli Ministry of Foreign Affairs director general Dore Gold said Israel attaches great importance to its relations with Zambia and looks forward to closer collaboration. “We have to say that we are very pleased that Zambia has opened this embassy and we look forward to further our relations with Zambia,” Mr Gold said. Earlier, Mr Kalaba also said Vice-President Inonge Wina is expected to attend a high-level international conference on women and gender to be held in Haifa, Israel. The opening ceremony was attended by senior government officials from the Israeli Ministry of Foreign Affairs, the corporate world as well the diplomatic corps accredited to Israel. Diplomatic relations between Zambia and Israel were fully restored in 1993 by former President Frederick Chiluba who later made a state visit to that country. Zambia’s relations with Israel were severed in the 1970s due to the Israeli-Palestinian conflict. Oh we remember that time when the old man lied to us he went to Israel to “woo” investors and visit the PM who wasn’t even in country when in fact he was hospitalised…these shameless liars!! Iyi yena ni zeee! Mwaulula a Lungu classified material. Ok we now know. God bless our beloved president. EL has confirmed what Zambia Watchdog wrote that Sata was in Israeli hospital. GRZ through the spokesman vehemently refused to accept that Sata went to Israel but today our dear EL has just disclosed thereby making the ZWD true. Too late. EL should have spoken of this immediately Sata returned from Israel. Well, sata went to Israel for site seeing! How did Israel help a tourist? He was not sick. That is what Lungu and friends told us at least! whata waste of tax payers money? something will give in soon!!! Finally, the construction of UNZA Ruins will be completed! At last the building plans will be availed to Zambia. Bravo Edgar! Israel? Israelis are close to God aren’t they? Closer to God than us. They are the chosen ones, the ones God blessed before all of us, thats why Fredrick Chiluba re-established relations with Israel. To cash in on these ‘chosen people’ blessings. So those Israelis should have just talked to him (God) and asked him to make Sata survive. They didn’t may be because they dont trust us. They knew we don’t really believe in their God. They called our bluff-we just want to have a shortcut from our African poverty Hahahahaha! The country’s economy has collapsed and as if that is not enough this visionless drunkard decides to create more districts and open more embassies abroad! What kind of reasoning is this mwebantu kanshi! Uyu chi colour, he makes decisions when high on whiskey! The country’s economy has collapsed and as if that is not enough this visionless drunkard decides to create more districts and open more embassies abroad! What kind of reasoning is this mwebantu kanshi!